Home > Press Centre > CELEBRITY SALON OPENS ITS DOORS ON TV3! CELEBRITY SALON OPENS ITS DOORS ON TV3! Welcome to a rollercoaster ride through the world of hair and beauty! In association with Peter Mark, each episode of Celebrity Salon will see the celebrity contestants mentored and trained in new skills as they compete to impress their mentor and a series of expert judges. 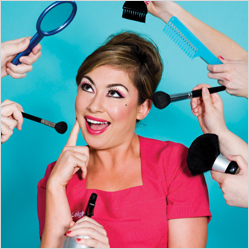 Watch the laughs, drama and tension unfold as Brian Dowling, Pippa O'Connor, Leigh Arnold, Virginia Macari, Celia Holman Lee and The Apprentice's breakout star, Breffny Morgan, cope with the wonderful world of tanning, waxing, hair and beauty. Living and learning together over an intensive two week period, each episode challenges these six very different and entertaining characters to complete treatments and styling assignments on some of the most demanding celebrities, sports stars and unusual members of the public for some of the biggest events in the social calendar. The contestants will be pitted against both the clock and each other, in order to win the grand prize and the title of ‘Best in Beauty’. From drag queens to the Dublin Glee Choir there are plenty of memorable characters - but none more so than the celebrities themselves, whose friendships, cat-fights and antics make this series compulsive viewing. It’s “The Apprentice” meets “I’m a Celebrity” and it’s the show everyone is going to be talking about! Don’t miss it. Tune in to Celebrity Salon in association with Peter Mark airing Monday 7th June 2010 at 9pm on TV3.